Invisalign is a series of removable, custom aligner trays that fit snugly over your teeth. With Invisalign, you can get a stunning smile quickly and discreetly, without the inconvenience of metal braces. Each set of clear aligners shifts your teeth gradually until they move into the desired position. The trays work by putting gentle pressure on teeth to make them move into alignment. You wear a new set of trays every two weeks until you achieve your desired results of straighter teeth. Invisalign is a series of removable, custom aligner trays that fit snugly over your teeth. Each set of clear aligners shifts your teeth gradually until they move into the desired position. The trays work by putting gentle pressure on teeth to make them move into alignment. You wear a new set of trays every two weeks until you achieve your desired results of straighter teeth. Invisalign trays are made from a hard, clear, BPA-free plastic, so they’re safe to wear and are especially beneficial for men, women, and teens with metal allergies. The trays are also more comfortable and easier to care for than wearing traditional metal braces. The clear aligners are barely noticeable and you can remove them to brush and floss your teeth. What can I expect at my Invisalign appointment? If you are a good candidate for the Invisalign system, Dr. Dennis then creates a customized treatment plan that shows how he expects your teeth to adjust with the Invisalign system. Once you have your aligners, you wear them for 20-22 hours each day. You will most likely have a dental checkup every six weeks to evaluate your progress. 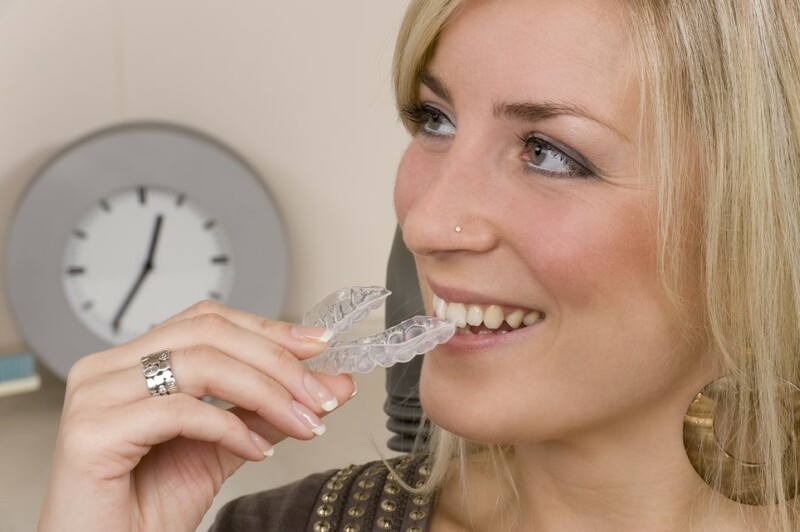 What kinds of dental problems can Invisalign fix? Each dental condition is different and everyone’s teeth have specific needs, but most of the time, the entire Invisalign process takes just 12 to 18 months. That’s typically half the time of traditional braces and Invisalign can correct nearly any type of orthodontic issue. If you’re considering braces for yourself or your teenager, call the office or schedule a consultation online to learn if Invisalign is the best option for your dental needs and lifestyle.